We are creating handmade jewelry. All our pieces are signed. 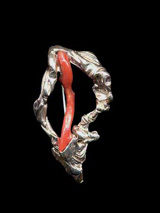 Many of them are unique while others are made in limited editions using the lost wax casting process. Everything is made from either100% pure silver or if the function of the piece demands it from a harder 950 or 925, silver alloy. All the enameling is done individually with the jeweler using a hand held torch to produce the best effect. Only genuine semi - precious or precious stones are used.